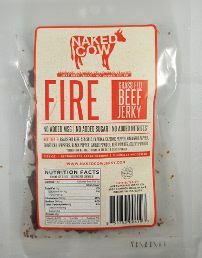 The next review on Naked Cow Beef Jerky will be on a 2.25 ounce/64 gram bag of their fire flavored 100% grass-fed beef jerky. This flavor is advertised as using their basic recipe, adding cayenne, habanero, and ghost chili peppers that really brings the heat. The bag was kindly submitted by one of the co-owners, Ron Myrick. 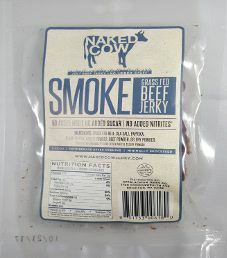 The next review on Naked Cow Beef Jerky will be on a 2.25 ounce/64 gram bag of their smoke flavored 100% grass-fed beef jerky. This flavor is described as something that may seem simple, but is complex and tasty. The bag was graciously submitted by one of the co-owners, Ron Myrick. 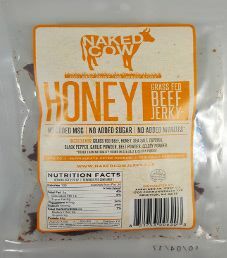 The first review on Naked Cow Beef Jerky will be on a 2.25 ounce/64 gram bag of their honey flavored 100% grass-fed beef jerky. This bag was kindly submitted by one of the co-owners, Ron Myrick.